Obituary for Anne Kingsbury Deming | Langeland Family Funeral Homes, Inc.
With great sadness, the family of Anne Kingsbury (Gower) Deming announces her passing on February 27, 2018. Born on November 7, 1921, in Lansing, Michigan, she was the daughter of Charles A. Gower and Hazel (Hayden) Gower. Charles Gower, a graduate of Columbia University, was an automobile salesman and managed properties. Anne grew up in a spacious house, in a leafy neighborhood, just off Grand River Avenue, near the Michigan State University campus in East Lansing. While the Gower family lived comfortably, Anne remembered her girlhood also as a time of belt-tightening and frustrations. Like many during the Depression, Charles Gower found himself idle much of the time. Anne remembered visiting him at his office and thinking he had nothing to do. Anne took violin lessons briefly, thanks to a man who owed her father money. Anne was deeply fond of her father, who died when she was 13 years old. She recalled with sorrow his months of suffering from cancer and the terrible stress that pervaded the household. During some of that time she was sent to stay with relatives on a farm in Ohio, where she remembered helping to extract chickens from a fence after a flood. After the death of Charles Gower, Hazel Gower, who before her marriage was a kindergarten teacher, was left to raise Anne and her three sisters: her older sisters, Martha and Dora, and her younger sister, Helen. Hazel managed well as all four daughters later attended and graduated from college. Anne always recalled a close-knit East Lansing neighborhood full of playmates. Anne was a tomboy who loved biking, sledding, roller-skating, and just being outside. When she saw neighbors getting ready to go to Lake Michigan, she would grab her beach gear and stand expectantly where she would be sure to get an invitationa�"or so she remembered. One neighbor made it a Sunday morning ritual to take neighborhood kids birdwatching on the Michigan State campus. From this experience, Anne retained an interest in birds, which she tried to pass on to her children, but with limited success. Anne graduated from East Lansing High School and attended Michigan State University from 1939 to 1941. Then, with an interest in becoming an occupational therapist, she transferred to Milwaukee Downer College in Milwaukee (now a part of Lawrence University; Milwaukee Downer's Milwaukee campus is now owned by University of Wisconsin-Milwaukee). It was an all-women's college and during wartime, Anne remembered the utter absence of young men. After graduating from Milwaukee-Downer in 1944, she was director of occupational therapy at Sigma Gamma Hospital School in Mt. Clemens, Michigan, from 1944 to 1946, acting director of occupational therapy at the University of Michigan Hospital, Ann Arbor, Michigan, from 1946 to 1948, and then director of occupational therapy at the Northern Michigan Tuberculosis Sanitarium, Gaylord, Michigan, in 1948 and 1949. In 1949, she came to Kalamazoo to take a position as assistant professor of occupational therapy at Western Michigan University. During that period, a friend arranged for her a blind date with a young attorney in Kalamazoo. She recalled meeting that man, Ned Deming, for the first time. She heard him, before she saw him, bounding up the stairs two at a time coming up to the apartment she shared with a roommate. Perhaps so as not to appear too eager, she let her somewhat taller roommate answer the door. He, according to Anne's version, was dismayed to be greeted by a woman taller than he was, but relieved to soon find that this tall woman's shorter roommatea�"more suited to his staturea�"was his date. Where did they go? To a Western Michigan basketball game, according to someone's version. That has a ring of truth, as they both enjoyed watching sports of all kinds. Over the years, they probably saw together more than a thousand sporting events of one kind or anothera�"including the 1968 Olympics in Mexico. But Anne, in her last years, recalled the first date was actually a movie. Anyway, a spark ignited and Anne married Ned Wesley Deming, of East Jackson, Michigan, at her mother's house in East Lansing, in June 1949. They lived for a time on Whitcomb Street in Kalamazoo, and there they brought home their first child, Virginia, born in 1950. Not long after that, they moved to Richland, Michigan, and into the distinctive "Gilkey" house on East D Avenue, a few doors east of the main intersection. The distinctive housea�"with a steep roof, bay window and "gingerbread" bargeboardsa�"is now called by some the "Deming" house. Its yard was then dotted with six or eight of great, handsome elms, which vanished one by one in the 1960s, victims of Dutch elm disease. To this house in quick succession arrived Stuart (born in 1951), Bruce (born in 1953), and Brian (born in 1954). Shortly after Brian was born, Anne was hospitalized at the University Hospital in Ann Arbor for six months with post-partum depression. Ned was left to look after a newborn and three small children, while managing a law practice, visiting Anne, and worrying about her well-being. Fortunately, some wonderful relatives and friends pitched in to help. By and by, Anne returned home. If she was later haunted by depression, she never revealed it. She never seemed to be despondent, rarely was downcast, never displayed self-pity. She loved being around people and good conversation. She was more inclined to listen than to talk. She laughed easily and never took herself very seriously. She was not inclined to raise a fuss but would if looking out for the less fortunate was involved. As a mother, Anne directed her brood with good humor, abundant common sense, and a knack for managing a three-ring circus: involving, for example, boiling frog's bones for a son's science project; pulling together Halloween costumes out of Ned's old army gear; and finding doll bottles for nursing kittens abandoned by their mother. Amid all the myriad moments of stress that motherhood brings, she was steady, reliable, and calm. She always made time to listen. Anne had a natural affinity for children. She liked being around them, and they around her. She retained all her life a child's sense of playfulness and curiosity. Her patience was amazing, but not infinite. She scolded. But she indulged her children's, and her husband's, idiosyncrasiesa�"probably more than was good for her or them. Anne and Ned planned and managed ambitious summer trips as far as both coasts: two adults and four kids - one susceptible to car sicknessa�"in a station wagon, without air conditioning, pulling a trailer. The family saw great swaths of America and Canada, but long days of driving sometimes ended after dark and in the rain. These were great adventures. When there were bumps along the way, Anne took the misadventures in stride. Family getaways to Glen Lake and Platte Lake near Traverse City were less strenuous and produced some of the family's most treasured memories. In Richland, she was a member of the Richland Presbyterian Church and was involved in a multitude of community activities. She worked from time to time as a substitute schoolteacher and, as her children were growing and entering high school, she toyed with the idea of becoming a high school counselor. She later acquired a master's degree in counseling from Western Michigan University, but never pursued a job in the field. The family moved to Kalamazoo in 1969, to a colonial-style house on Kilgore Road. In time, Anne became equally involved in Kalamazoo. She was, for example, a board member of the Southwestern Michigan Lung Association and the Michigan Lung Association, a state representative to the American Lung Association, and a board member of the Michigan Association of Regional Medical Programs. For a number of years, she assisted local physicians in running what was called the Major Disease Clinic, which chiefly provided medical care for indigent children. In 1971, while Anne's eldest was in the hospital, Ned suffered a heart attack. While he recovered, she took on all the responsibilities of managing the family, watched over the recovery of her husband and daughter, and proved steady and immensely capable. With their recovery and slow rehabilitation, and with her sons off to college and careers, Ned and Anne indulged in travel. In their many trips to far-flung destinations, they seemed to favor the less-traveled paths and places not quite ready for tourists. In addition to Europe, Australia, South America, and the Soviet Union, they visited China just as it was opening the door to tourists. If there was a choice between first and second class, they chose second. If there was a choice between second and third class, they chose third. They sometimes preferred not to make hotel reservations in advance, would arrive in a strange city by train late in the day and take what was available, sometimes landing in somewhat ramshackle accommodations. They would laugh about it. It was all part of the adventure. They were frugal, but they also thought by traveling more austerely, they would be more likely to meet ordinary people, either travelers like themselves or natives of the places where they traveled. They enjoyed seeing the sights, but they were more interested in acquiring friends than souvenirs. Indeed, they established many friendships in their travelers that lasted long after the trip was over. Over the years, they kept in touch with friends in Australia, Great Britain, Japan, Brazil, and Eastern Europe. Some visited and traveled with Ned and Anne in the United States. In a few cases Anne and Ned played a role in helping people immigrate to North America. Anne and Ned often told the story of helping out Japanese newly-weds traveling by train in France. They were on a train with the couple when the man stepped off the train at a stop and didn't get on by the time the train departed. About that time, the panicked young woman came to the attention of Ned and Anne, and they got the attention of the conductor. Even though the young woman spoke no English or French, they figured out what had happened. The accidental separation was happily resolved at a station down the line. Anne and Ned stayed in touch with the young couple for years. One of the great pleasures of Ned and Anne was going to University of Michigan and Michigan State University football games. Anne was a devoted follower of Michigan State sports, especially football and basketball. Ned was just as devoted to Michigan. For them, about the most fun you could have was having Anne's sloppy Joes outside on a crisp autumn afternoon in Ann Arbor or East Lansing just before the big Michigan-Michigan State football game. In their later years, Ned and Anne also began to spend winter months in Florida. They rented a condo on the beach in Santa Rosa Beach, where they made many lasting friends. Following's Ned's death in 1998, Anne continued to spend a few months each winter at the same condo. She enjoyed her time in Florida immensely, especially the camaraderie of the "Bobbetts'"a�"the women who gathered most mornings at the pool for exercise and gossip. She continued with these excursions to Florida into her 90s. 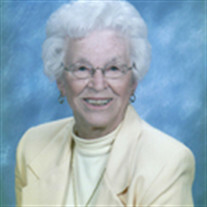 As a widow, Anne enjoyed good health for many years and remained active. At family gatherings for her 80th birthday, she kicked around a soccer ball with her six-year-old twin granddaughters. She was very involved at her church, Westminster Presbyterian Church. Up until she was nearly 90, Anne regularly spoke of driving "elderly" people to their medical appointments as a volunteer with the Shepherd's Center in Kalamazoo. In time, circumstances dictated that she move into an assisted living facility in Kalamazoo, New Friends Dementia. In keeping with her good nature, she gladly made the transition and, despite a fading memory, faithfully watched the news, followed her Spartans, and remained acutely interested in staff and her fellow residents and all that was about her. One of Anne's passions was reading. She loved books throughout her life, but especially in her later years when she had more time and when other activities became more difficult. She especially liked histories and biographies. Her favorite author was Doris Kearns Goodwin. She confessed she wept in reading the final pages of Goodwin's Team of Rivals, about Abraham Lincoln. She frequently recommended books to anyone who would listen. Surviving Anne are her four children, daughter Virginia, who lives in Oshtemo with her husband, William W. Fox; and three sons: Stuart, who lives in Kalamazoo; Bruce, who lives with his wife, Mona, in Madison, Wisconsin; and Brian, who lives with his wife, Carol Damioli, in Toronto, Canada. Anne is also survived by two grandchildren, Kira Deming, a student at Colorado State University in Fort Collins, Colorado, and Mira Deming, a student at St. Olaf College in Northfield, Minnesota; by one sister, Helen Henderson, who lives in Dearborn, Michigan; and by a sister-in-law, Charlotte Deming, who lives in Gainesville, Georgia. She was predeceased by her husband Ned Deming; her oldest sister, Martha Drake and brother-in-law Gerald Drake, of Petoskey, Michigan; another sister, Dora Thompson and brother-in law John Thompson, of Kalamazoo; brother-in-law Philip Henderson of Dearborn; brother-in-law Richard Deming, his first wife Charlotte Deming, and his second wife Mary Deming, of Jackson; sister-in-law Virginia Sabin and her husband Harold Sabin, of Wyoming, Michigan; and brother-in-law Robert Deming of Ann Arbor. A memorial service is scheduled for March 10, 2018 at 11:00 a.m. at Westminster Presbyterian Church at 1515 Helen Avenue, Portage, Michigan 49002. The family will be available for visitation before the service at 10:00 a.m. and there will be a light lunch available immediately following the service.